Most bikes look more or less the same, but luckily there are a few brave designers who rethink how bikes should look, and what they should be capable of. We, therefore, asked Mads from Cykelvalg to find us some examples of how designers are rethinking the classic folding bike. This is what he came up with: 8 folding bikes that are really rethinking how a folding bike should look. The first folding bike was invented in 1893, and the classic Brompton folding bike design is almost 40 years old. This electric folding bike will also work as a charger for your laptop, cellphone and other electronic devices you might have. All the protruding parts on the bike can be folded together, so the bike takes up very little room when stored. The bike was designed in 2008 by Yuji Fujimura. There isn’t hardly anything written about it online though, so this one probably never got to production. This Bergmönch folding bike can be folded together and worn as a backpack. Perfect for when you are trekking in the mountains and don’t want to carry your downhill mountain bike with you. It even has full suspension just like a downhill mountain bike have. The Bergmönch Backpack is designed by the bike company Koga. Everything folds on this bike. And when the parts are folded together, they all fit inside the round frame, that matches the size of the wheels perfectly. The Locust was designed by Josef Cadek in 2006. This one can be converted into a trolley, so it’s easy to transport (most folding bikes needs to be carried around when folded – and they often weigh 12-15 kg or more). The Grasshopper was designed by David Goncalves in 2008. This bike isn’t really a folding bike in the traditional sense. Instead, it’s a bike with average size wheels, that can be folded on the middle, so you can wrap it around e.g. a pole, to protect it from theft. The Bendy Bicycle was designed by Kevin Scott in 2010. Initially, the Cart Bike looks like most folding bikes. But the real magic happens, when it is folded together and works like a shopping cart instead of being just another bike. The Cart Bike was designed by Hyuk-Jae Chang in 2010. Folding bikes are impressive, but this bike takes the folding concept to a whole new level! When the One is folded, it’s smaller than other folding bikes, and it also doesn’t have any protruding parts. The One was designed by Thomas Owen. Almost all folding bikes work like ordinary bikes when they are folded out, but here is one that is a bit different. 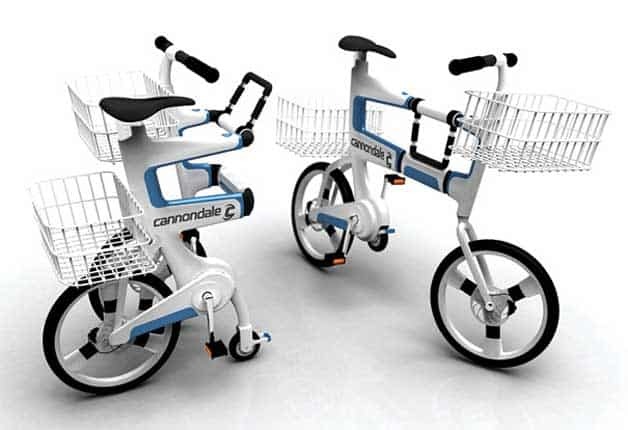 When this one is folded out, it will work as a recumbent bike with all the many advantages of such bikes (recumbent bikes are generally considered faster and more comfortable than other bikes). The Grasshopper was designed in 2007 by HP Velotechnik. Yeongkeun Jeong from Seoul, South Korea came up with this great idea. When you live the slow life in the city, and prefer to go grocery shopping on your bike, this is a great way to get some extra storage. The band is made of elastic material, and you apply tiny silicone stickers, to keep the band in place. It adds stability to the structure, and you can wound the rubber around the triangle any way you like, to make it more personal, and work optimally for the things you’d like to store on your bike. It’s an easy idea to do yourself, and the great thing about this design it that it will help you transport irregularly shaped items, that won’t fit on the bike’s luggage rack. It’s a great little project that you can do with stuff you have lying around the apartment, so you might be able to reuse and recycle some old straps. This DIY bike bar is such a fun idea for a bike picnic – and a brilliant use of space. These guys built a mini bar into the unused space in the bike frame. The bike bar has room for 1 bigger bottle and a few smaller ones, Cups, coasters and other nig-nags you might need for the perfect bike picnic or date. A funny DIY idea for a Saturday project. The sides of the mini bar flip down and become a small table. A very civilized and stylish way to enjoy a drink while on a bike ride. To top it off this small triangular bar is outfitted with dual speakers, to set the mood for your bike picnic in the park. I’m sure this bar is very inexpensive to build, and can probably be built mostly from scrap. Look at this picture, and tell me – isn’t this just amazing? I would love to ride like that if I have kids. What is the yearly cost of a car? A little googling and you will come up with something in the range of $ 8.000 pr. year. On an average income, you would have to work at least 10 hours per week to earn this. So imagine you lose the car. You will get 10 free hours per week, and have the freedom to ride a bike like this. You will have freed up time in your life to be able to spend the time it takes, to ride this awesome bike, instead of sitting in the car. ..And we haven’t even considered all the fresh air, the exercise and the quality time you will spend with your kids on these rides. We got rid of our car a little more than a year ago, and we haven’t really missed it. When we do miss it, we just remember the number of hours we would have to work to own it, and we quickly come to the conclusion that our life is much richer now that we don’t have a car. Of course, we need a car sometimes when we go visit friend and family outside the city, but then we just rent a small car. Try to calculate how many times you can rent a car – or even take a cab – before you start reaching the amount of money equivalent to owning a car. To check out this bike and other bikes from this company go to xtracycle.com. I think we will see a lot more folding bike designs in the future, as bikes continue to find their way into our cities. Bikes are the perfect green alternative to cars, and with a nice space saving design like this, it will make perfect sense to buy a well-designed bike, that you can bring into your small apartment. It is very important to be able to bring your bike into your apartment, so it won’t get stolen during the night, and to be able to do this you need a lightweight design, so you can carry it. And one that folds away easily, so you can squeeze it in wherever you have a little extra space.